The M40A1 has to be the pioneer of the modern sniper rifle. The USMC has always had a leg up on the US Army when it comes to sniping (Remember, I am US Army, so it takes a lot to say this!) and the USMC realized that they needed a standard sniper rifle that could perform the job up to standard. After testing and reviews the USMC placed the initial order for 700 Remington 700/M40 sniper rifles in 1966. 550 of those had the Redfield 3-9x accurange scope mounted. As time progressed, the weaknesses of the factory M700/40x rifles began to show. The all wood stocks were very prone to shifting in changes in the weather and other weaknesses were noted. So a process began to upgrade the M40 rifles. There is no “official” date (at least that I can tell) when the M40 was replaced by the M40A1, but the process happened in the early 70’s. 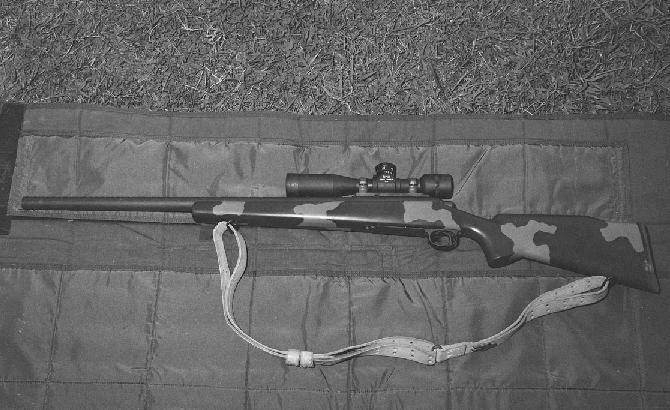 The wood stocks were replaced by McMillan fiberglass stocks, which are known for their ruggedness. The entire system is built by USMC armorers at Quantico, VA. The Redfield 3-9x scopes were eventually replaced by a specially designed scope built by Unertl to USMC specifications. This happened in the early 80’s and this is was the standard scope being used on the M40A1’s and the A3’s up until 2006 when the Schmidt & Bender PMII 3-12x scopes were adopted to replace the Unertls. The M40A1 is an outstanding system, very capable of extreme levels of accuracy, though the older M118 ammo tended to hold the rifle back to about 1 MOA, but the new M118LR (designed by the USMC) really unleashed the potential of these rifles with accuracy improving to about .5 MOA. The Max Effective range of the M40A1 is listed at 800 meters by a lot of sources, but the USMC says 1000yards (915 meters) and I would have to go with the USMC on this one, as we routinely shoot past 900 meters with our M24 SWS, and the M40A1 is everybit as accurate. The USMC has replaced the aging M40A1’s with the new M40A3’s. A rifle that has been in the developement stages for some time now. The M40A1’s have served extremely well for many years (over 30). She’ll be missed, but the A3 is a capable successor. For those of you who would like to purchase a M40A1 for your own collection, several manufacturers make excellent reproductions of the M40A1, some even built to mil-specs. But you cannot purchase an ORIGINAL M40A1. I served 6 years in the Marine corps as an O311 following in my uncles and grand fathers footsteps, so this model is near and dear to my heart. I would like to purchase or build one for work. C&H Precision built mine. A veritable tack driver. A CMP purchased Unertl MST 100 sits on it. There is also a group buy of USO MST 100s on snipershide. Greg 0317 is a scout/sniper mos. Unless you were 0326 mos. I myself was a mos 8541 and also was with Kilo 3/8, Charlie 1/8 and. Echo 2/8. Primary was 0351. I have a twin who was a sniper in the marines and he carried the m40 in the early 70s. I was also a Marine. I was in communications. We did not see any action as Veitnam winding down by then. Semper Fi. How can I tell if I have one of the original USMC 700 Remington 700/M40 sniper rifles of 1966? My uncle was a Marine in the armory during this time and the one I have that he gave me when he died has a red field scope on it but I don’t see any markings on it to indicate it’s authenticity. The receiver would be clip slotted (meaning there is a notch at the rear of the receiver that was cut out to allow stripper clips to be inserted) and I believe the action should have a 5 (maybe 6?) digit serial number that does NOT start with a letter. From there, the best way would be to call up Remington and give them the serial number of the rifle and they would be able to tell you. Karen, there are some problems with this. There were a finite number of these guns purchased from Remington. None of these guns were ever sold but some have been donated. If your uncle worked in an armory and brought home this gun, chances are good the Marines are still looking for it. MCO 8300.1C is the Marine Corps Serialized Small Arms Accountability Program order. I would recommend you contact MCSYSCOM PM Ground Weapons at Quantico for guidance. Or dont say anything and just put it back in your safe and enjoy your uncles memento to you unless you want someone to take it from you. I done some reloading , long enough to know , that over all bullet size is factor in tightening a shot group. As I know each rifle and each bullet brand and style. measure different. Here is my question, for you …….Your contract for, should have case length , Feet per second and over all length, and missing any this here? Was the 30.06 as opposed to 7.62 Nato ever used as a sniper round in Vietnam? I have sorta inherited an M40A1 from my Marine big brother.. Kinda stuck with it as he needed cash. It was built by MSGYSGT Eric (hacksaw) Reid while at GA precision. It is built on a 1960ish 6 digit Model 700 serial 289XXX and built according to 2112 armorer specs. complete with atkinson barrel, USO MST-100 and original contract mounts.. Any idea what something like that is worth?? It sounds like a very nice and accurate reproduction with the correct scope. The reproductions will not carry the same value as an original one, but they are still valuable as a well made rifle and with historical significance. It is hard to say for sure as there are not a lot built that way, but yet one could still be built today (in other words, not limited production. But for the complete package in excellent condition, somewhere in the $5k neighborhood is feasible. Will take testing the water and seeing what the market will give.